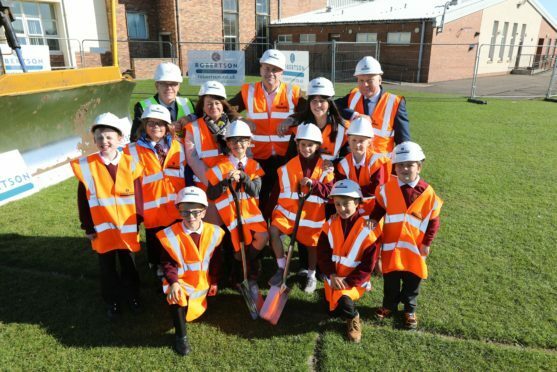 The first sod has been cut on a new £14 million shared campus in Arbroath. Under a plan agreed last year, Hayshead and St Thomas RC primaries will occupy a new campus on the playing fields of the current Hayshead site. It will include dedicated teaching spaces for the two schools, shared multi-purpose halls, general purpose rooms and a campus library, as well as an early years facility for nursery youngsters in the two schools. Community facilities and two sports pitches have also been incorporated into the project, described as an important step forward in local education by Angus children and learning committee convener, Councillor Derek Wann. The multi-million pound scheme – part of the Arbroath schools project – is being managed and delivered by hub East Central Scotland and constructed by main contractor, Robertson Tayside. Arbroath East and Lunan Conservative councillor Mr Wann, said: “The new campus features a range of modern fit-for-purpose learning spaces. The main vehicular access to the site will be from Hayshead Road, with the existing parking spaces on St Abbs Road also being retained. Following completion of the development, pedestrian access will be retained at the St Abbs Road and Horologe Hill entrances. Gary Bushnell, chief executive of hub East Central Scotland, said: “It is great to see work now starting on site and we look forward to delivering another two high quality schools for the community when the campus is complete. Robertson Tayside managing director Keith Dickson, said: “With the build now commenced, we look forward to continued engagement with the local community as the construction programme progresses. Gemma Boggs, education delivery director at the Scottish Futures Trust, said: “Our management of the Scotland’s Schools for the Future programme is helping all of Scotland’s 32 councils succeed in delivering the very best teaching and learning environments within ever-tightening budgets.